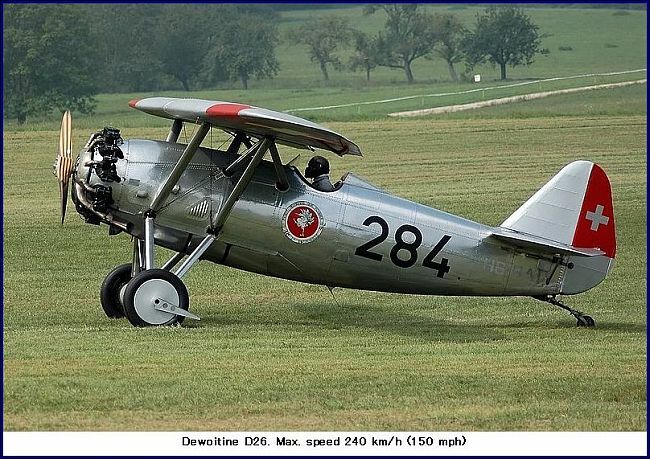 Here you can see the collection of Dewoitine Airplane Photos. A Frenchman named Emile Dewoitine was the designer and manufacturer of approximately 90 different aircraft. 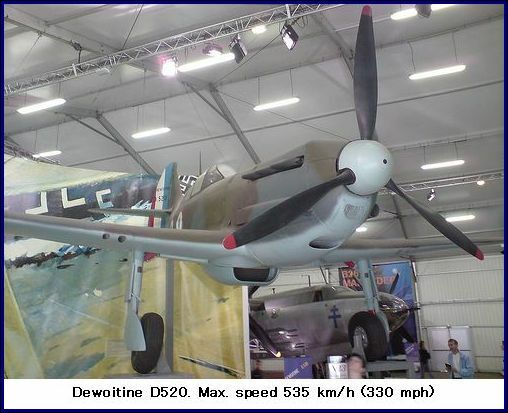 The Dewoitine D520 (pictured below) was France's best fighter aircraft during The Battle of France in 1940. 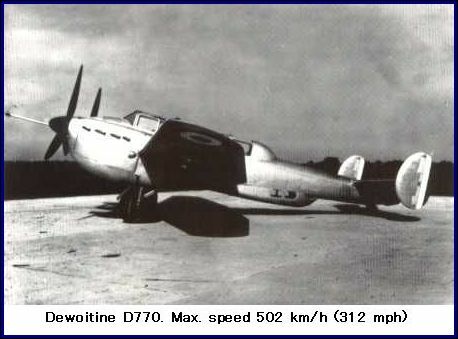 All of the earlier built Dewoitine airplanes were purpose built as fighter aircraft. 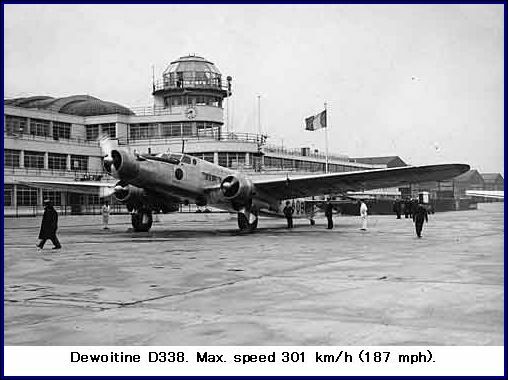 Three of Dewoitine's aircraft were built for commercial use. The D332 which crashed in a snow storm on it's return test flight from Saigon (now Ho Chi Minh city, China). The D333 was the improved result of the D332. Three aircraft were ordered by Air France. The D338 was the third commercial aircraft. This could carry 22 passengers. There were 30 of these aircraft ever built. 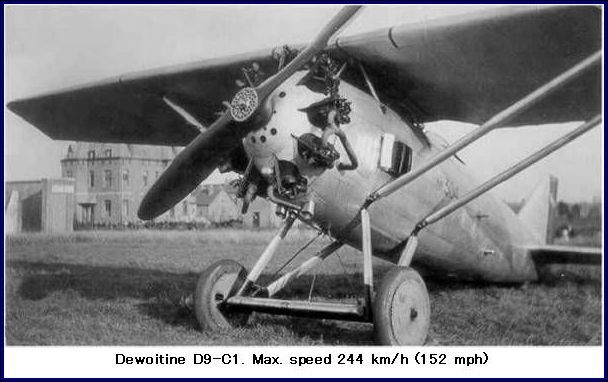 The D9 was flown in 1924 and was equipped with a 9 cylinder 420hp Gnome-Rhone 9Ab Jupiter IV radial engine. Maximum speed was 244 km/h or 152 mph with a range of 400km or 249 miles. 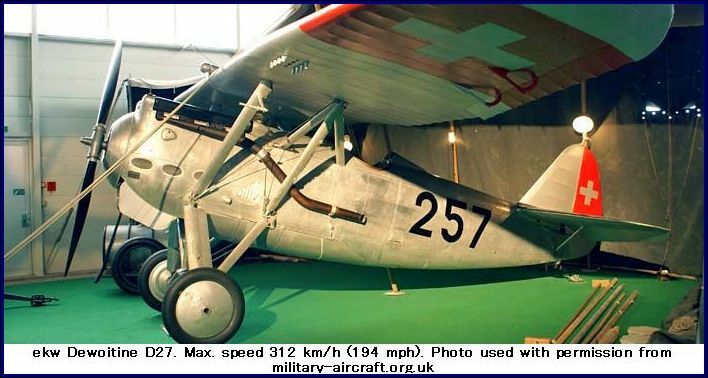 The wingspan was 12.8m or 42'; wing area 25m squared or 269.1 sq feet; length 7.3m or 24' 11"; height 2.93m or 10' 7"
There were four guns fitted to the airplane - two fuselage-mounted 7.7mm Vickers guns and two wing center mounted Darne modele 19 guns of 7.5mm calibre. Six D9s were sold to Yugoslavia and one to Belgium. The D27 was powered by the 500hp Hispano-Suiza 12-cylinder Vee engine and had an armament of two synchronized 7.7mm guns. Three of the D27s had been ordered by Romania, three by Yugoslavia and one by Argentina. The D520 was so named as the maximum speed reached during tests was 520km/h. There were 891 of these aircraft built for war purposes. After the war the D520 was converted to a dual control trainer aircraft. Perhaps you would like to assist expand the existing collection. We would appreciate all information and/or Dewoitine photos you may wish to contribute. Click here and leave your details and we will respond promptly. Return from Dewoitine Airplane Photos to Airplane Photos.